I was pleasantly surprised to discover woodworkers are bringing my pumpkin and watermelon patterns to life in wood. The patterns are extremely versatile and most can be executed in wood with no changes. The opposite is true as well. 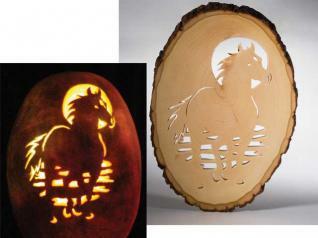 Scroll saw patterns can easily be cut in pumpkins or watermelons for festive seasonal displays. 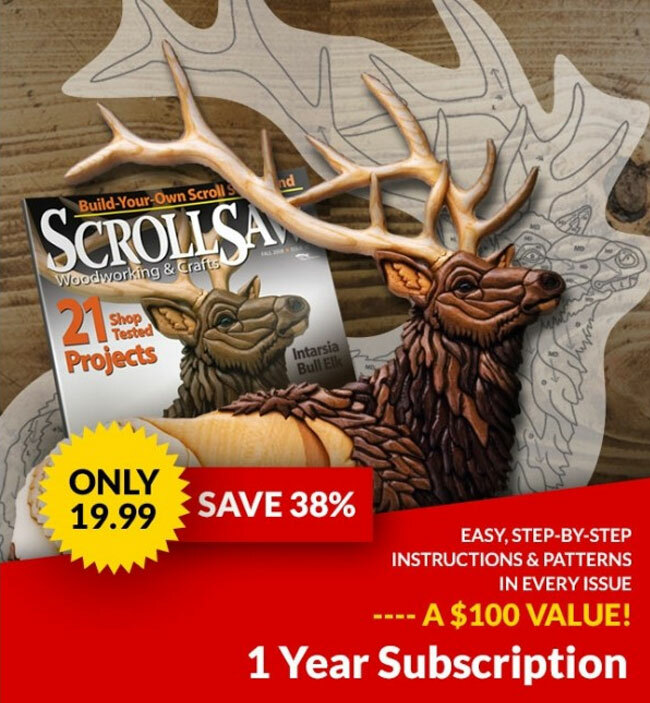 I’m always flattered to see wooden art derived from my patterns and am eager to try fruit-cutting techniques with traditional scroll saw patterns. Whether you are creating patterns for fruit or wood, the basic design theory is the same. You need solid and cut-out spaces, and you need bridges, or connecting areas between the solid areas. If you don’t pierce the whole way through the fruit while carving, you can get away with “floaters,” or solid areas that don’t connect. When creating a pierced fruit design or cutting the pattern in wood, the technique is essentially the same. You want to remove the spaces so the solid areas convey the design. When the image is cut in wood, a backer board creates the necessary contrast. 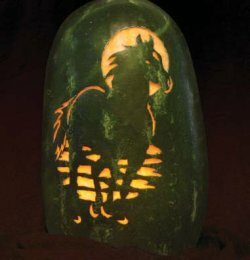 When the image is cut in fruit, a light inside the hollowed fruit is used to create the dark and light contrast. While I am demonstrating the techniques on a watermelon, the process is identical for a pumpkin. Step 1: Hollow out the watermelon. 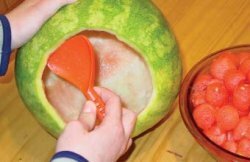 Use a melon baller tool or ice cream scoop and save the fruit in a bowl. Then scrape out any remaining fruit. The more fruit you remove, the longer your carving will last. The fruit turns rancid faster than the hard rind. Step 2: Transfer the pattern. 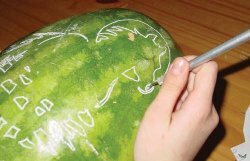 Tape the pattern to the side of the watermelon. Make slits in the pattern to help it conform to the round surface. Poke along the pattern lines with your tool of choice. Remove the pattern and use it for a reference. Pounce white flour into the poked holes to make them more visible. Step 3: Carve the design. 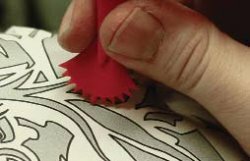 Follow along the dotted lines with a small carving saw. 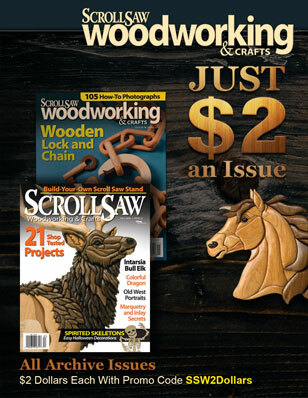 Use an up and down sawing motion, similar to the way a scroll saw blade cuts. Plan your cuts to provide support to fragile areas. Look at the letter “C.” If you cut the outside of the “C” first, there is little support for the inside of the “C.” This will increase the likelihood that the inside of the “C” will break off and ruin your project. Cut smaller details before larger ones. Step 4: Display the carving. 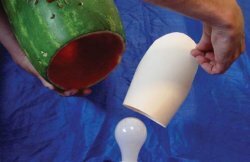 Use a candle or a 15-watt light bulb on a flat base to illuminate the fruit. If using a light bulb, create a diffuser from an old manila folder to soften the glow. CLICK HERE to download the Moonlight Stallion Pattern.